Members of Burkina Faso's newly appointed government pose for a picture at the Presidential Palace in Ouagadougou on Friday. Ouagadougou, Burkina Faso (CNN) -- In the latest shake-up following weeks of popular unrest and sporadic violence, the top two political figures in Burkina Faso announced on the state-run media outlet that they'd fired 24 Cabinet ministers and formed a new, smaller government. President Blaise Compaore and newly appointed Prime Minister Luc-Adolphe Tiao said Thursday night on Radio Television of Burkina that there will be 29 people in the new Cabinet, down from the 38 in place previously. The full rationale for the shuffling wasn't immediately made clear. Tiao is expected to take questions from the press in the coming days. Besides ousting 24 ministers, the two men also said they have brought 15 different individuals into the administration. 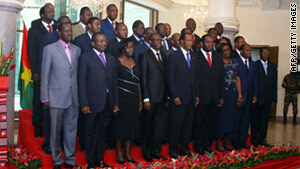 In addition, Compaore will serve as defense minister as well as president. Djibril Bassole will become the landlocked West African nation's foreign affairs minister -- a position he'd earlier held, before being tapped as the joint United Nations-African Union mediator for the crisis in Darfur, Sudan. The country's sitting foreign minister, Bedouma Alain Yoda, was among those left out in the new arrangement. The ministers for culture and tourism, infrastructure, health, education, environment, youth, social action and animal resources also have not been retained, according to Compaore and Tiao. The new government combines several Cabinet branches. Among those, the telecommunication ministry joins with that of transportation, security comes into the ministry of administration, and the human rights ministry becomes part of the justice ministry. This news came two days after Compaore tapped Tiao, Burkina Faso's former ambassador to France, as prime minister -- a report also broadcast on the national radio and television network. All these moves follow several recent breakouts of popular discord and violence in the African nation. Student protests have been ongoing in the nation since February, according to local media reports. These demonstrations came after a student reportedly died in jail. On March 30, protests erupted over a court case. According to media reports, a man sued a group of five soldiers, claiming they forced him to take off his clothes and walk home because he had dated a soldier's girlfriend. The court found in favor of the man. During the violence that ensued, the defense minister said, his home was attacked. A small group of presidential security guards revolted April 14over a disputed housing allowance that they said the president had promised them. They fired shots inside the presidential compound and took to the streets, shooting guns, stealing cars and robbing people, according to defense ministry officials. Two children of a defense official were shot at in the melee and were hospitalized, officials said. The defense ministry issued a statement the following day saying the soldiers had been paid. And Moussa Ag Abdoulaye, a spokesman for a group of security guards, said on state-run TV that its members remained committed to Compaore and called for a cease-fire. Still the protests continued, during which buildings in the capital city, Ouagadougou, were set on fire. The president also reportedly replaced the head of the nation's army amid the violence. The president was at the palace when the demonstrations began and left briefly under heavy security, but he later returned. In recent days, a curfew was imposed, and sources in the city of Po said violence was also taking place there.